We try to ship all orders within one business day. (For exceptions, see our back order policy.) In fact, on most business days, orders received by 3:00 PM Pacific time are shipped the same day. Machine orders are shipped a day or two after we receive them. We use this time to arrange the trucking that you requested. Truck shipping costs and details are on the Shipping tab on machine product pages. We will send you a package identification number about 5:00 PM Pacific Time on the day your shipment leaves here. If your entire order is sent directly from one or more of our suppliers the package identification number will only identify the envelope containing the invoice. We do not usually get tracking numbers from our suppliers. You will usually receive "tracking information" when we mail you a credit invoice. If you are not expecting a package, and the shipment method is First Class Mail, then the "package" probably contains a credit invoice or other communication. Our shipping charges include the amount that UPS or USPS charges us; we do not mark up this charge. You choose the shipping service you want and we calculate the exact cost to ship your order from Pasadena, California. Shipping charges may also include the cost of package protection (for orders over $100.00) and a handling charge (for international postal shipments). All shipments are FOB Pasadena, California. Add the items you are interested in to the Shopping Cart. On the Shopping Cart page, select the appropriate country and enter your postal (ZIP) code. The available shipping options display automatically. Click the Update Cart button if the shipping options do not appear. Click the button to the left of the option you like. Some items we sell are shipped directly from our supplier. Many of these are heavy items where the cost of shipping from our supplier to our warehouse would significantly increase the price. It might be a day or two longer before a direct-from-supplier item ships, and you will receive it in a separate package from other items on your order. You might receive this item a few days before or a few days after you receive items shipped from our warehouse. All direct-from-supplier items are clearly indicated on the product page. Most of our suppliers will not ship outside the United States. On international orders, all direct-from-supplier items are shipped to our warehouse and combined with the rest of your order before we ship to you. This delays the shipment of your order for one to two weeks. Mail is usually less expensive for shipments that weigh less than 2 pounds and for items that fit in certain flat rate boxes, but to get the best price you should consider both USPS and UPS, regardless of weight. USPS provides an economical solution for shipments to Alaska, Hawaii, and other US possessions. Many times USPS shipping rates look high. This is because we include the cost of package protection on orders over $100.00. If you live in a US possession or protectorate, assert your independence! Select the name of the possession in the Country list. Because UPS treats most US possessions as separate countries, some appear in both the State or Province list and the Country list. If you select the US possession in the Country list, the Web site should figure out where you are. Despite the "free" trade promises of NAFTA, shipments from the U.S. to Canada can still incur considerable costs. NAFTA means no duty, but you're still on the hook for GST and PST, of course. Here's some information that may help you avoid surprises and, more important, save some money. On the Shopping Cart page, select the appropriate country and enter your postal code. Economy - Either UPS Standard or Priority Mail International is the most economical means of shipment to Canada. UPS Standard packages are fully tracked. You can check the status of your package at any time by visiting UPS.com. Guaranteed Delivery - UPS guarantees that UPS Standard packages are delivered on time. UPS takes 4 (BC) to 7 (NS) days to deliver to Canada. Faster Shipment - UPS packages are picked up from our warehouse every afternoon. As soon as you receive the tracking number from us, call UPS and tell them you want to "self clear". Ask UPS to send you the commercial invoice. Ask for the address of the local UPS warehouse. Take the commercial invoice, your photo ID, and all the information you have to the nearest Canada Border Services Agency (CBSA) office. Pay the fees and they will give you form B15. Call UPS and ask them how to provide them with the CBSA B15 form. Then send it to them. Wait for your package to be delivered. It may be 4 or 5 days. You can find a more complete procedure here. We recommend UPS Worldwide Saver and UPS Worldwide Expedited for shipments to Canada. UPS waives its customs brokerage fees for packages shipped by air. We offer a large discount on these services, which puts your total cost near or below that of Priority Mail International for heavier packages. You can receive your shipment in 3-5 business days (and track it) instead of 1-2 weeks for a very small difference in cost. The US Postal Service and Canada Post provide another alternative. Priority Mail International is sometimes less expensive than UPS, and Canada Post only charges an $8.50 CAD entry preparation fee. For more information about Canadian taxes and duties, visit the Canada Border Services Agency Web site. When comparing Priority Mail International to UPS services, remember that we add a $5.00 handling charge to cover the cost of completing the USPS paperwork. This charge is included in the shipping charge on the Shopping Cart page when you choose any international postal service option. If you choose Priority Mail International shipping we use Priority Mail Flat Rate Boxes (or envelopes) when they will save you money. We adjust the shipping amount on your order when we are able use a flat rate box. Flat rate boxes are limited to 20 pounds (9.07 kg). There are six sizes of flat rate boxes, ranging from 8.63" x 5.38" x 1.63" (219 mm x 137 mm x 41 mm) to 12" x 12" x 5.5" (305 mm x 305 mm x 140 mm). Express Mail International provides another faster but more expensive option. It does not offer guaranteed delivery times, but does provide tracking. The post office estimates delivery time of 3 to 5 business days. Canada Post charges $8.50 CAD for entry preparation. We ship to many parts of the world. You can place your order on our Web site and choose an appropriate shipping method. The total cost of your order, including shipping and handling, is calculated before you commit to placing the order. We recommend UPS Worldwide Saver and UPS Worldwide Expedited (where available) for international shipments. The list of countries to which we ship is provided by UPS and USPS. If your country is on the list, we probably ship there. We do not ship to countries with onerous paperwork requirements, such as requiring notarized or authenticated invoices. If we find that your country has such requirements we will notify you and cancel the order. In some cases, the onerous paperwork requirements are triggered by the value of the shipment, so we might ship some orders but not others. Likewise, we will not meet onerous paperwork requirements that might save you duty or taxes. If we cannot complete the paperwork in our offices, without extra expense, we will not do it. We will not have paperwork notarized or signed by third parties such as the chamber of commerce. We will not ship your order with false documentation, such as listing the products as gifts or at prices lower than we charge. We are required by our shippers to include accurate export documentation and we will not risk our ability to ship internationally to save you money. The cost of the products you purchase is included on the export documents. The cost of shipping is not included. In some cases international customers may wish to combine shipments from several vendors to save on shipping costs. Bongo International and Shipito provide this service. They provide you with a US address to which we can ship your order. They will combine it with orders from other suppliers and forward it to you. 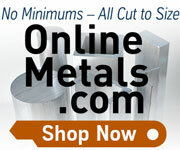 You simply use the address that they provide as the shipping address on your LittleMachineShop.com order. Because UPS treats most US possessions as separate countries, some appear in both the State or Province list and the Country list. If you select the US possession in the Country list, the Web site should figure out where you are. Most international shipments are made by Priority Mail International. This service provides a good balance between cost and delivery time. Because of the large discounts we offer on UPS Worldwide air services, be sure to compare these services to Priority Mail International. We add $5.00 handling to orders shipped out of the US via the US Postal Service to cover the cost of completing the USPS export paperwork. This fee is included in the shipping cost. If you choose Priority Mail International shipping, we use Priority Mail Flat Rate Boxes (or envelopes) when they save you money. We adjust the shipping amount on your order when we are able use a flat rate box. Flat rate boxes are limited to 20 pounds (9.07 kg). There are six sizes of flat rate boxes, ranging from 8.63" x 5.38" x 1.63" (219 mm x 137 mm x 41 mm) to 12" x 12" x 5.5" (305 mm x 305 mm x 140 mm). Express Mail International provides another faster but more expensive option. It offers guaranteed delivery times only to Australia and Japan, but it provides tracking to all countries. The post office estimates delivery time of 3 to 5 business days. We recommend UPS Worldwide Saver and UPS Worldwide Expedited (where available) for international shipments. We offer major discounts on expedited shipping with UPS. The rates for UPS air shipping are often comparable to the rates for Priority Mail International. You can receive your shipment in 3-6 days (and track it) instead of 1-2 weeks (or more) for a very small difference in cost. UPS returns some rather cryptic error messages that are displayed at the bottom of the Shopping Cart page and the top of the Checkout page. In general, they mean you should select a different UPS service or check your address and postal code. In many parts of the world you must choose UPS Worldwide Express because they do not offer anything else. If you don't have the right combination of ZIP or postal code, country, and shipping service, then you might get a shipping error displayed on the Web page. The most common error from UPS is "The requested service is unavailable between the selected locations." This means that UPS does not offer the shipping service you have chosen to your destination. Correct the ZIP or postal code or change the selection in the Ship By list, usually to a more expensive option. The most common errors from USPS are "Please enter a valid ZIP Code for the recipient." and "No Destination City State found." These both mean that USPS does not recognize the ZIP code as being in the US or its possessions. Correct the ZIP code or choose the appropriate country. We automatically protect every package that we ship against loss and damage. The fees for this protection, which are included in the shipping cost, are shown in the table below. These fees are significantly lower than the fees charged by UPS and the Post Office. Value of products Domestic International Domestic International No extra charge. Included in the cost of truck freight. * First $100.00 is always free. For example, the cost of protection for a $210.00 UPS shipment to the United States is $0.50.